This is a really cute Halloween-themed “Hangman” game. The sarcastic talking skeleton is a hoot. Thanks to Eileen for sending this to me! I was in a hurry tonight and had some chicken breasts in the freezer, so I went to my ol’ trusty epicurious and did an “advanced search” for a main dish with chicken that was kid-friendly. This recipe from Gourmet magazine (January 1996 – yikes – an oldie!) looked good and said that it could be prepared in 45 minutes or less. – I used boneless, skinless breasts (3 fairly large ones), because that’s what I had on hand. I’m not wild about bone-in breasts with skin, unless they’re fried and I can pick them up to eat them. I think they’re too hard to eat with a knife and fork and it wouldn’t be possible to pick them up with the gravy on them, so I adapted. – I doubled the amount of marinade/sauce ingredients, to make sure that I would have enough for the increased amount of chicken. – I missed the part about patting the chicken dry, so my chicken went into the skillet, marinade and all. This caused a DEFINITE lemon flavor to the gravy, but we liked it. Not sure I’d do it that way again, but it was good. – I did overcook the chicken just a bit, so it was a little tough, but I was paranoid that it wouldn’t cook through on a low simmer and that the gravy wouldn’t thicken, so I upped the heat a bit. A bone-in breast probably wouldn’t have been so fast to overcook. – We sliced the breasts up for serving and then spooned the gravy over the top. We didn’t serve it over rice or pasta, but it would have been good that way (we may do that with the leftovers). 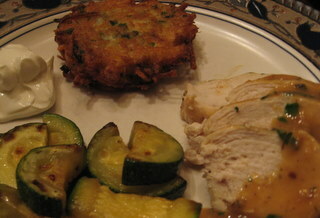 To go with it, I made these potato pancakes again (the kids LOVED these and have been begging to have them again) and this zucchini, which the kids like so much that they are now calling it “the good zucchini”. The meal was good, but it was a bit of poor planning on my part. I don’t usually like to have more than 2 dishes that babysitting on the stove. If I can relegate one to the oven or rice cooker and set a timer on it, that’s my preference. I was pretty busy trying to saute zucchini and simmer chicken and fry potatoes all at the same time. My stove has an interchangeable grill (you can switch between the grill “module” and a two-burner “module”) on one side that I like to keep in place because I use it a lot, but it does mean that I usually only have two burners. It took some planning to pull this dinner off with that hindrance, though. I had to start the chicken on a burner (browning) and then prepare the roux/gravy and then I put the pan on the grill side to simmer while I cooked the potatoes and zucchini. It worked, but it took a little finagling. I’ll do anything I can to not have to change out my grill module (it’s not even that hard – I just LIKE my grill. It also has a griddle that can go on that side that we use for bacon, eggs, pancakes, grilled sandwiches, etc.). Well, I was cleaning out my purse this morning (because, oddly, it seemed a little bulky and heavy), and came across not two, not four, not even six……but yes, folks…..TEN AA batteries. Not much new cooking this weekend, but Hubby and I did a bunch of home improvement projects. I painted Girl’s bathroom a rich, lovely milk chocolate shade and Hubby replaced the toilets in both Girl’s and Boy’s bathrooms. We are TIRED. I may not be doing much cooking this week, because I’m going through closets and trying to figure out what to pack for my NYC trip this weekend. I’ll be back on the 15th, though, and ready to start cooking some cooler weather recipes (soups and risottos and short ribs – Oh, My!). Granny: Don’t look at this video; you won’t like it. I saw this posted on Dooce today. Turn up the volume and just wait for her to hit the pole. Author laraPosted on October 3, 2008 Categories Misc2 Comments on Granny: Don’t look at this video; you won’t like it. These two recipes really don’t “go” together, but they were both delicious. 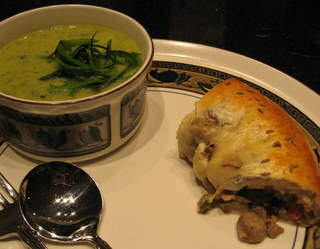 This soup was phenomenal and would make an excellent first course or accompaniment for almost anything. Obviously, it would be great with Italian food. It was also VERY easy (I LOVE my immersion blender) and is quite healthy. I substituted chicken broth for the water, just to take advantage of the opportunity to add a bit more flavor. The hardest part of the soup was figuring out how to make the peel juiliennes. I tried two different methods: a mandoline and a julienne peeler. Neither of them worked well at ALL (I think I need to work on my technique), so I ended up just peeling off wide strips of peel with a paring knife and then slicing them into julienne. The empanada was also quite yummy and pretty easy. It reminded me a little bit of our taco ring, but the flavors were more subtle. 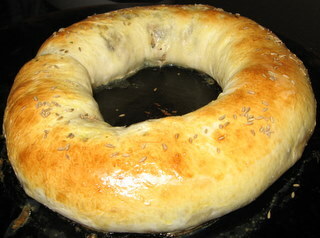 I actually like this one better and may use the bread dough (instead of “crescent” rolls) the next time that I make “our” taco ring. Girl said that she really liked this (Boy ate dinner at a friend’s house tonight, so didn’t get a chance to weigh in). I did switch the recipe up a tiny bit. Hubby has a pathological fear of raisins. Seriously, it’s just not explainable, but it is not a subtle or remotely ambilavent feeling that he has about them. He says that they taste like dirt. So, to placate Hubby, I substituted black beans for the raisins. The recipe made a TON of filling and I was not able to fit it all into the bread (if you are able to stretch that bread dough out to a 12 by 14 rectangle, you must be a magician! ), so I have another entire batch of filling in my freezer now, for future use. I think that it might be good over rice instead. The “picadillo” seasoning is not dissimilar to taco seasoning, but also had some dehydrated raisins (that I had to pick out) and sliced olives in it. Next time, I may try to make my own spice blend instead. 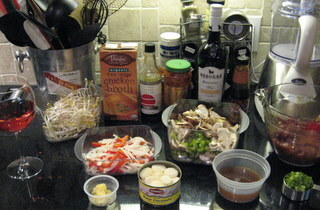 I made this recipe for Chop Suey tonight (from Emeril Lagasse). It was recommended to me by a friend that has kids about the same age as Boy and Girl. – My grocery store didn’t have shiitake mushrooms alone (this time, although I’ve found them there in the past), so I bought a “blend” of shiitake, portabella, and a few others. I pulled the portabellas out for a future use (they were big, thick, easily-identifiable slices) and used the rest, because the whole package was bigger than the amount called for in the recipe. I will probably make some kind of mushroom omelet tomorrow. -I used brown rice to serve with it, instead of white, because, well…I just do that sort of thing. -The recipe says “Heat wok…add oil…”, but doesn’t mention oil in the recipe list and doesn’t specify what kind of oil or how much, so I used peanut oil, about 2 Tbsp. – I don’t have a wok, so I used the biggest, widest skillet that I have. It’s pretty darn big and heavy, so it retains and conducts heat pretty well, but not well enough. I’ll be asking Santa for a wok. This modification made the biggest (negative) impact on the finished dish. So, the deal is…the dish was good, but the pork wasn’t browned enough (because I didn’t have a wok) and the vegetables got a little mushy and watery (because I didn’t have a wok) and the sauce was a little wan looking (because I didn’t have a wok). The flavors were still good, but would have been better and the vegetables would have been more crisp….guess what…if I had used a wok. The good news: the pork was VERY tender, not overcooked or chewy at all. 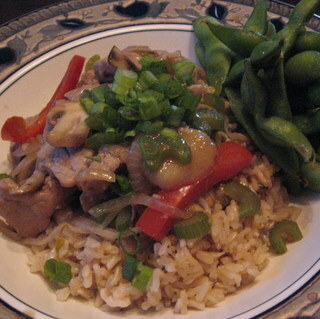 I served this with some steamed edamame, which both kids love. Girl also loves red peppers and water chestnuts, so she liked this pretty well, even though it contained…(ewww!)….meat. Boy liked it pretty well, because it contained….(yum!)….meat. He tolerated the mushrooms and liberally used sriracha and ate his weight in edamame. Some of you have asked where I buy all of my cake decorating supplies and boxes. The answer is the All-in-One Bake Shop. You do NOT need to be logged in or create a flickr account to be able to view these photos. I didn’t know what to expect, at all, from this contest. I had no idea how many cakes there would be or how many of them would be “professional” ones, but my mom categorized the victory as a “smackdown”. I wasn’t there, but I’m just positive that my sweet, supportive mom was able to be objective (yeah, right) in her assessment. Actually, the judges were impartial third parties and the provenance of the cakes was not marked. In any case, I have a blue ribbon coming my way. Mom made sure to remind me that this is an annual event. Yikes! As long as it’s not a “State Fair” theme every year, I’m sure I can come up with something. Author laraPosted on October 1, 2008 Categories Desserts, Misc2 Comments on It won!